What better pattern to share for Easter than a cross. This pretty cross is made using a small steel hook and cotton crochet thread. I am so in love with how it came out! You can add a loop at the top for hanging, add a tassel for a bookmark, or even add some beads for a little color. Finished cross measures approx. 4¾ in. x 3¾ in. Puff stitch: Yarn over hook, draw up a loop in designated stitch, repeat twice more, yarn over and pull through all 7 loops on hook. Long single crochet (Lsc): Draw loop through designated stitch to height of row being worked, complete as single crochet (the Lsc takes the place of the next stitch in the current row). Picot (p): Chain 3, work 1 single crochet in the third chain from hook. Ch 9, join in furthest chain from hook to form a ring. Foundation Round: Ch 2, *work 1 puff st into ring, ch 1, rep from * 11 more times, join in top of beginning ch — 12 puff sts. Round 1: Ch 1, work 1 sc into same ch sp as join, 2 sc in next ch sp, *ch 12, Sl st in 6th ch from hook and each of the next 6 ch, work 2 sc in each of the next 3 ch sp of Foundation Round, rep from * twice more, ch 20, Sl st in 6th ch from hook and each of the next 14 ch, work 2 sc in next ch sp of Foundation Round, 1 sc in next ch sp, join in 1st sc of round — 4 points of the cross and 24 scs. Round 2: Ch 1, 1 Lsc over st from previous round and into same ch sp from Foundation Round, 2 Lsc over sts from previous round and into next ch sp from Foundation Round, *sk 1st sc at beginning of point and work 1 sc in each of the next 6 ch, [1 sc, ch 1, puff st, ch 1, puff st, ch 1, puff st, ch 1, 1 sc] in center of ch-5 sp, 1 Lsc over sts from previous round and into each of the next 6 ch, sk last sc, work 2 Lsc over sts from previous round and into each of the next 3 ch sp from Foundation Round, rep from * twice more, sk 1st sc at beginning of point and work 1 sc in each of the next 14 ch, [1 sc, ch 1, puff st, ch 1, puff st, ch 1, puff st, ch 1, 1 sc] in center of ch-5 sp, 1 Lsc over sts from previous round and into each of the next 14 ch, sk last sc, work 2 Lsc over sts from previous round and into the next ch sp from Foundation Round, 1 Lsc in next ch sp, join in 1st Lsc of round — 21 sts on Points 1 through 3; 37 sts on Point 4; 24 Lscs. Round 3: Ch 1, 1 Lsc over st from previous rounds and into same ch sp from Foundation Round, 2 Lsc over sts from previous rounds and into next ch sp from Foundation Round, *work 1 Lsc over sts from previous rounds and into each of the next 6 ch, 1 Lsc into ch-5 sp, ch 1, puff st in next ch sp, ch 1, p, [puff st, ch 2, puff st] in next ch sp, ch 1, p, [puff st, ch 2, puff st] in next ch sp, ch 1, p, puff st in next ch sp, ch 2, 1 Lsc in ch-5 sp, 1 Lsc over sts from previous round and into each of the next 6 ch, work 2 Lsc over sts from previous round and into each of the next 3 ch sp from Foundation Round, rep from * twice more, *work 1 Lsc over sts from previous rounds and into each of the next 14 ch, 1 Lsc into ch-5 sp, ch 1, puff st in next ch sp, ch 1, p, [puff st, ch 2, puff st] in next ch sp, ch 1, p, [puff st, ch 2, puff st] in next ch sp, ch 1, p, puff st in next ch sp, ch 2, 1 Lsc in ch-5 sp, 1 Lsc over sts from previous round and into each of the next 14 ch, work 2 Lsc over sts from previous round and into next ch sp from Foundation Round, 1 Lsc in next ch sp, join in 1st Lsc of round — 33 sts on Points 1 through 3; 49 sts on Point 4; 24 Lscs. For best results, I recommend blocking these crosses. If desired you can also brush the finished cross with either a homemade or store-bought stiffener. For stiffening instructions, see my Star of Bethlehem pattern. I just finished one of these, and it turned out beautifully. Thank you so much for sharing this pattern. It is written very well. Hope by Easter we can get a Picture Tutorial of where the LSC is going into the points. Love Love Love this Cross. I’m another one in desperate need of a video tutorial/instructions. I am a self taught still learning somewhat beginner crocheter. I love this this pattern but not sure if I can successfully complete without visual instructions. Sounds like some of us have been over two years for video. Please make one. I love this cross you are very talented. I tried hard but was not successful in following your instructions of the Lacy Cross Crochet Pattern. Your tutorial, be that video or pictures, is so necessary for me and for many others. Please, please do it. Thank you. I made one to my father. Lovely. Thank you! Hi, I’m a french woman and I want to made this crochet, but it’s difficult to me to traduce your explications. Do you have a tutorial video or an image with the explications (with cross, rounds, and commun crochet explications) ? Thank you very much !! Thank you – this is beautiful. I have started to make it this evening (Good Friday) I hope that I will have a finished cross by Easter Day. 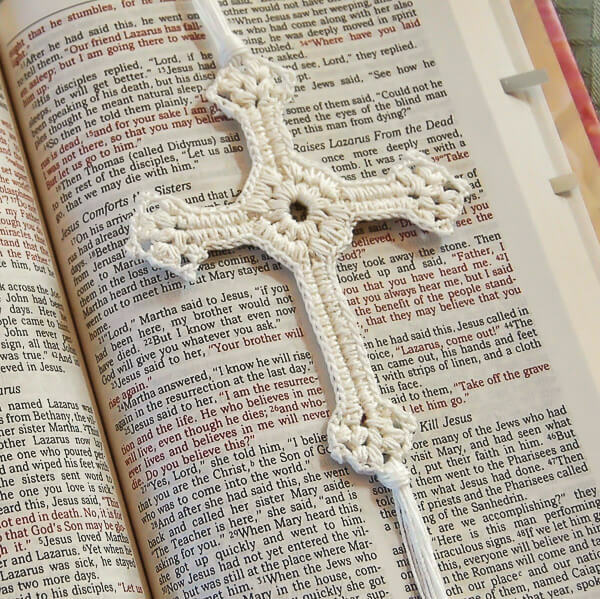 Hi, I am a retired minister and received many crochet crosses from my parishioners, but not as beautiful as this one. Beautiful work. Pastor Don. SOO Gorgeous!! I am kind of a new crocheter and don’t quite understand all the stitches and terminology, though. I think you posting a YouTube video of you making this would be very helpful to a lot of people!! I just finished making one! It was very easy to follow and turned out perfect!! Thank you so much for the pattern. Yay! So glad you liked it!! Hi Becky 🙂 I am sorry you are having trouble. It is definitely one of my goals to make a video on this at some point. I really like this pattern but i’m having a really tough time after the foundation round “work 1 sc into same ch sp as join, 2 sc in next ch sp”, where exactly am I working th 1st sc? I’m not sure what “same ch as join” means. I appreciate any insight. Hi Stacie 🙂 you will be working the 1st sc in the same chain space that you joined your last round. Love this pattern! i have made several of them and even make some that are two colors.I havent tried the beads yet as im not sure where exactly to put them. For the two colored ones do one color in starting ring, foundation round, and in the 3rd round, do the other color in rounds 1 & 2. I am so glad you like it! Yes, I hope to have a video tutorial on this soon. anyone that can do this is amazing to me! First of all the directions are written in some foreign language that is not even spoken on this planet, then some people actually come out with the beautiful results? Just lets me know there are some aliens on the planet crocheting crosses for us- this is good to know! Hermoso trabajo, personalmente soy fan del crochet.Tiene mucho tiempo que estoy buscando una Cruz se acerca la primera comunion de mi hijo y deseo realizar esta hermosa obra de vos. Pero me he detenido en la segunda ronda. No teneis grafico. Saludos y todo lo que realizais esta hermoso. Bendiciones. 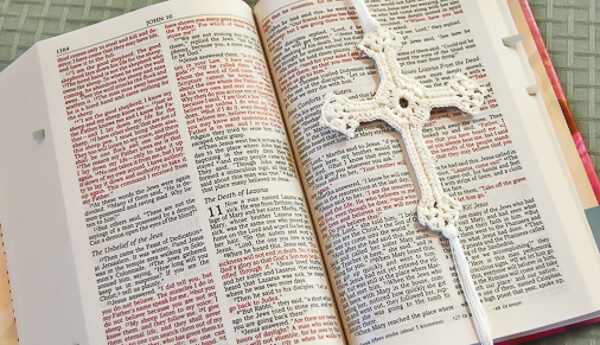 My synagogue shares space with the church and I see the prayer books for the church and want so badly to crochet this beautiful cross – and slip the finished piece into one of their books. Alas, my crocheting isn’t very good and don’t know about following the directions. For now, from my heart to each of you and yours, Sweet Pesach and Blessed Easter. Alas, the ‘nice thought’ doesn’t get the crosses into the hymnals. Lina, No rush Navidad! En primer lugar tenemos que pasar por Pascua y Pascua y unos cuantos otros días festivos. Bienvenido – desde el sur de California. I’m pretty sure the online translation might not make sense to you. Have you been crocheting for a long time? Made 7 of the crosses(I knew when I took them to church,my friends would want them) and the collection box looked good that Sunday. I just found your blog a couple of days ago. So thrilled to do so. I made the lace cross. I will be making more to hand out to family and friends. I will also be making the star of Bethlehem ornament. Thank you for the patterns. I’m sure you have more that I will be making. Just checking in to see if you do have a tutorial or picture tutorial. Love this but just not sure on round 2. To see if that makes a difference. I am sorry you are having trouble, Anita 🙁 I am hoping to make a video tutorial on this so hopefully that will be Able to help. Hi Anna 🙂 Ch sp stands for chain space, not the next stitch. Hope that helps! Aw I absolutely love this!! So dainty and beautiful. Thanks so much for sharing! I would love to make these for aunts and a few of their special friends. I am unfamiliar with the stitches. Did you ever make a video? Does it take a long time to make? A long single crochet is worked over the row directly below and into the stitches two rows below. Hi! I love this pattern and beautiful cross! I tried it yesterday w/ a 4mm hook and thread (the smallest I had) and I love how it turned out. Going to get a 2mm hook and smaller thread today. 1 question – what do you mean at the end when you say, “For best results, I recommend blocking these crosses.” Thank you for the clarification! 🙂 God Bless!! I love this pattern so beautiful. My granddaughter is getting married in November of this year and I have started so many crochet items for her shower. But this will be at the top of my list I am sure she will keep it forever. thank you for the final piece that will make me happy to have done this for her.. I responded to you via your email. Maybe your picture could be changed to the Hebrew bible section: Psalms / Proverbs, for instance. Thank you for responding – much appreciated. Since my synagogue has deep connections sharing space in a church, I thought it would be nice to crochet lacy crosses to add into their bibles the church leaves in the pews. But, have changed my mind — the showing of anti-Semitism in the bible picture continues to spread hatred. I’ll work on something else for the church. Hi Marl 🙂 I am sorry this has offended you. I have been over and over the post a dozen times and can’t figure out or find anything that I believe would be anti-Semitic or offensive. Haters gonna hate and be rude. Thanks for the pattern! Hi, I love the pattern, but like a bunch of others, I am stuck at round 2. I saw that you were going to try and make a video of this pattern, is one available? Or even different step by step pictures? Love your cross but hung up on round 2. Do you have a video on this pattern? Would love to share this with the women who crochet at church. Hi Jean 🙂 I am sorry you are having trouble. I am hoping to get a video up at some point. It worked!! Thanks so much! God Bless!!! The cross is what I have been looking for. Want to make some for friends that have lost a spouse. Also for some women that have been displaced by the West, Texas explosion. The problem I have is that I cannot get it to print. Any hints?? Hi Joan 🙂 So glad you like it! I just saved it as a pdf and sent it to your email. Hope that helps. Hi Donna 🙂 I say give it a try and see. You might surprise yourself at how much you can do. Let me know how it turns out. Enjoy! I just found this pattern and it is absolutely beautiful! I can’t wait to make some for my friends at church. Thanks for providing such a wonderful pattern! I am so glad you like it Jamie! God bless! This is a beautiful cross. Excellent way to share the gospel!!! Keep on Sharing!!! I am so glad you like it! God bless! I am so glad you like it, Brenda! And it makes me so happy to know what you are using them for 🙂 Thank you so much for the sweet comment. God Bless! This cross is so pretty! I hope I can make it. Just learning to crochet. I, too, paused at round 2. Maybe your answer will get me going again. Will certainly share the blog with my friend/teacher. For some reason I am getting really hung up on round 2. I’m just not sure that I am understanding correctly what I am supposed to do after the ch-5 sp on the points. Can you please clarify? Am I supposed to have one side of the point in sc and the other side in lsc? Thanks!!! So Lovely! Thank-you for sharing! oh how lovely!! gives a reminder while I am reading!! so pretty! So pretty! Thanks for sharing at Terrific Tuesdays. Hi Sally 🙂 To make one with beads, make sure to string all the beads on your thread before you start crocheting. Then when you reach the point where you would want a bead, move one up to next to your hook and work your stitch around it. The bead will show up on the opposite side of your work. Hope that helps! Pitty I only work with graphic. Hug and Happy Easter ! Thank you so much, Anna! I wish I had the software to do symbol patterns. There are so many times when I think it would be so much easier to understand than when written. Beautiful. Just beautiful! Thank you for sharing this pattern. New to your Blog. Thank you for the beautiful cross pattern. Is there any way you could do a picture tutorial .